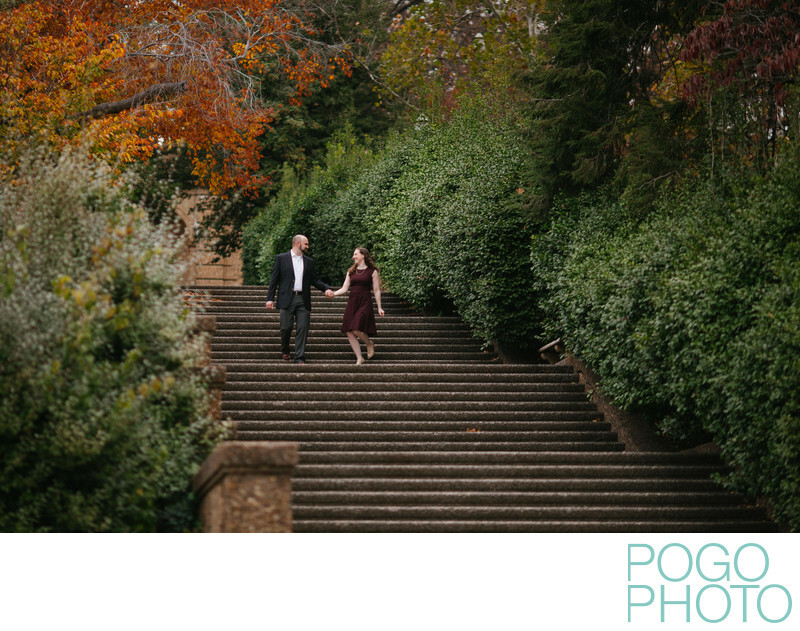 During a destination engagement session at Washington DC’s Meridian Hill Park, we captured this candid moment of a happy couple descending down a grand staircase next to the Cascading Waterfall. We travel through Washington DC at least twice per year when we move from our winter home in South Florida to our summer house in Vermont and we love getting the chance to work with our friends and clients while we are in town. We first visited Washington DC together years ago on a personal trip to attend a Redskins game at FedEx Field with friends. We decided to fly up for a long weekend and experience the city entirely on foot, a welcome change of pace when compared to driving everywhere at home and during our road trips. We walked over ten miles the first night, having the streets to ourselves on that chilly December evening. Witnessing so many famous buildings, memorials, and parks together at night with barely anyone else around left a lasting impression on us and has permanently altered how we view the city in a spectacular way. Each time we watch the introductory sequence during an episode of House of Cards we are reminded of our weekend there half a decade ago. Meridian Hill Park was a new destination for us during this engagement session, having only seen photos of it online. The couple lives nearby, making this a convenient location just walking distance from their front door. The park reminded us of planned gardens throughout Europe, and we later learned that those European terraces were the inspiration for the original design, which to us means the designers succeeded admirably. The park uses the hill wisely as its natural slope acts to help separate the Italian Renaissance style displayed in the upper half from the French Baroque style represented by both the fountain and lower pools. We have a running joke regarding non-photographers who mean well but always suggest that a couple should go “kiss by the fountain,” a phrase exclaimed repeatedly by planners and coordinators. They are not necessarily wrong, but being driven by the quality of light much more than the appeal of a fountain reminds us that we approach things differently than most. Here, our couple kissed by the fountain for about twenty minutes as we strolled up and down the staircases surrounding the Cascading Waterfall. The thirteen basin public artwork was completed in 1936 and is the centerpiece of Meridian Hill Park. Inspired by 16th century Italian villas and built by John Joseph Early, Cascading Waterfall is the largest fountain of its kind anywhere in North America. A walk through Meridian Hill park is a stroll through the history of our nation’s capital. Long before it was a park, “Peter’s Hill” was a tract of land owned by a local merchant when Washington D.C. was created in 1791. The hill provides an elevated view of the White House and is located directly north of it, a distinction noticed by then president Thomas Jefferson. He had a marker placed at the top of the hill created creating a north-south line dubbed the “White House meridian.” White House construction had just been completed four years earlier and the surrounding city was just beginning to be developed. The White House meridian provided an orientation point for roads and buildings as they were constructed in accordance with the predetermined layout of this planned city. About a decade later, the hill would be the location for a private mansion that would survive the War of 1812 and the Civil War, but sadly be irreparably damaged in a fire in the late 1860s. In the last part of the nineteenth century the area was acquired by a former Senator and his family from Missouri as a site on which to build their impressive stone home, now known as Henderson Castle. The home was just the beginning as they had much bigger plans for their newly purchased land. The hill as we see it today uses the space wonderfully, but having it reserved as a park was actually the third public use option proposed in 1898. The first idea was to use the top of the hill as the site of an enormous mansion that would dwarf anything in the area and actually replace the White House as the presidential residence. Obviously that idea did not come to fruition, nor did option two which involved using the space to house the Lincoln Memorial. That proposal was rejected, as were multiple future plans for construction of a monument to Lincoln because they were too grand, with many suggesting that instead of having a giant memorial the city should erect a simple shrine in the form of a log cabin. Twelve years later, the design of the Lincoln Memorial as we know it today was approved. Meridian Hill Park is technically part of Rock Creek Park, and therefore comes under the jurisdiction of the National Parks Service. Visiting all 59 National Parks the NPS operates is a goal of ours, but the service also oversees thousands of other monuments, historic homes, and parks. In the District of Columbia, 23.2% of the total land area is managed by the NPS including the mile-long National Mall. This is also the portion of the government that stepped up by renovating portions of the city had been neglected by the governing body of the district, the United States Congress. Just within the last 20-30 years, the parks of Washington D.C. have seen a dramatic revitalization due to the efforts of private citizens and the National Parks System working in conjunction with one another. As huge fans of the NPS, we applaud all they do across the country in terms of preservation and ease of accessibility. Whenever we visit a National Park facility, we are reminded that as US citizens we actual own everything we see around us. Meridian Hill Park is just one of many recently discovered places for us that we can now recommend people visit based on personal experience rather than just reputation. Location: Meridian Hill Park, 2400 15th St NW, Washington, DC 20009.